20110524 - Up and boys off to school, I got to take G to Preschool today. Dropped G off, got myself a haircut then back to the desk. 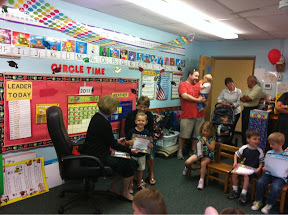 Ran back to G's school to see him singing and go to his room for a graduation ceremony. He got a diploma but wouldn't wear the big square hat. After graduation G&I went to McD's to have lunch and celebrate. Back home and finished the day off behind the desk. Out and trying to help D with math, he doesn't know division!?!?!?!? Had dinner then a quick stop at J's soccer game before heading to the airport and off for Chicago tonight. Met up with Richard and Steve at ORD and had a couple beers.